The design brief was simple, for an experienced graffiti artist that is. The fact that the artist could combine his knowledge of digital design to create the graffiti font was an added bonus. However the idea behind the creation of this art piece was to take it beyond graffiti… Traditionally painting graffiti font is an artisan art form. I wanted to sketch it by hand but produce it using modern computer technology. The graffiti font was initially drawn using a stylus pen and an Ipad. The application being used was Meritum Paint. Each graffiti letter was drawn and saved as individual image files. The individual letters were saved and exported into Photoshop and then re-sized to 300DPI and spaced out on a A2 sized Photoshop document. This is the file size for the graffiti font book DTP layout (the dimensions required for print publishing). Each individual graffiti letter was treated using a selection of Photoshop effect layers. Ultimately keeping the letters as separate elements each graffiti font letter was styled & tweaked to produce the rainbow style look. The end result is what you see here. Whenever you are designing a piece of digital art it is important to remember; it is always a good idea to design at the correct final print size or on a larger scale, never design something at a smaller size than the final intended print size, and remember to set your DPI to a minimum of 300 if you are intending to indeed to print it! Golden rule: never design small and upscale, design big and downsize! Don’t panic are a UK online and printed media promotional company. They’ve been running for quite a long time now and are a serious advertising force to be reckoned with. Most people living in the UK active on the clubbing and live venue party scene in the past 10 years or so would have definitely seen Don’t Panic media’s advertising. Effectively a bumper flyer pack. Many UK venues stock them and all the best parties in UK will have a Don’t Panic representative distributor handing out the flyer bumper packs. Not only do they contain flyers and invitations to live events they also have been known to include other items. Some of the items found in the packs include chewing gum, combs and even condoms, generally anything relatively 2D that is smaller than 30cm squared or that can be folded up to fit in the ravey bundles of joy. Every couple of months the online Don’t Panic Media website hosts an interactive art poster design competition where artists and designers alike are free to enter the competition. Artist entries come from around the world and the level of design standards and originality is usually held very high. Many famous designers and artists have been known to enter and to win the Don’t Panic design competition. However the beauty of the competitions is that no one is excluded from designing or entering their artwork. The judging for the competition is based on a democratic voting system where art lovers and design obsessives can log in to cast their votes for who they think should win the prize for the given art design competition. Usually the top 10 voted entries will be selected for a final judging round by an esteemed panel of artists or designers who cast their final decision. From memory past judges have included some very big names indeed such Pure Evil (East London Graffiti legend), Obey (Shepard Fairey) and even Banksy (if memory serves correct). The prize for the winning the design or art competition is to print the artists design onto a large A2 poster size which is included in the previously mentioned flyer bumper packs. These flyer packs are distributed all across the UK with some 10,000 odd copies of the packs being printed every month, if not way more! This is why these winning poster designs are such a common almost religious feature in almost every UK student household. Also in it’s own way it acts almost as a check point and trophy for so many artists who enter and win this competition. 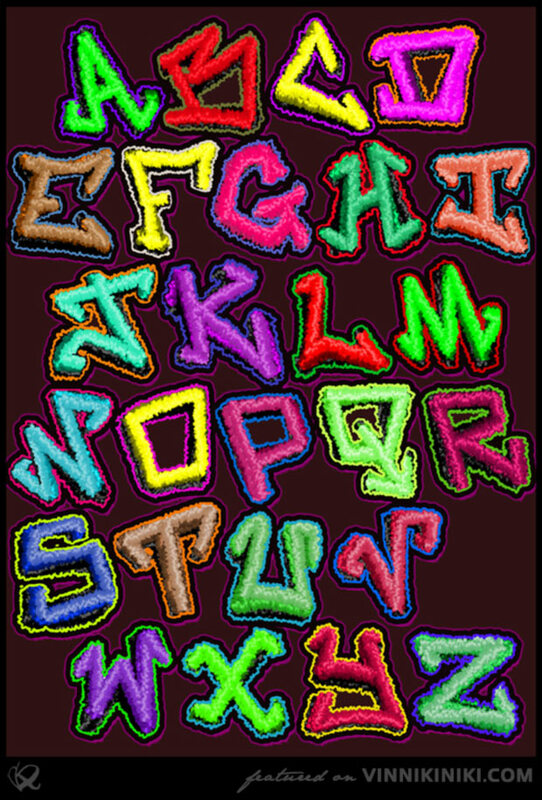 This particular graffiti lettering alphabet art design was not only to be printed and included in the bumper flyer packs. It also carried the additional prestige of being included in what has fast become a sort of religious graffiti street bible artifact, a book known at “Street Fonts”. Published by Thames & Hudson, compiled by Claudia Walde it is a collection of graffiti fonts from all over the world. Written with massive love and passion for both Graffiti font art and the Street Art as a whole. Big thanks go out to Don’t Panic media for offering an outlet and competition ground for artists to get noticed. Biggups Claudia Walde who spent over 2 years collecting the graffiti alphabets for the inclusion into this amazing book. For those of you who haven’t seen it, grab a copy, as an artist no matter what skill level your at with your graffiti font lettering or as a graffiti street art lover or enthusiast this is definitely something you want to have included on your bookshelf.